Believe it or not, I’m not ready to post about the Romans yet. So much of this old, historical information is contradictory that speaking with any confidence of accuracy is difficult. Out of frustration I actually turned on YouTube and listened to a livestream of one of my own personal favorite writers doing a Q&A. Yeah. That soothes me. Some people use music, other people use video games. I use podcasts and livestreams. I think part of the reason I like to listen to writers talk is that they tend to use sentence construction that reflects how they write. Often by listening to them speak, I can work out portions of my articles that I’m having trouble wording… if that makes any sense. It’s inspirational, in a matter of speaking. That, and they also spend just as much if not more time thinking as they do writing. Trust me. Turning it off is hard sometimes. “Those who know history tend to be able to see things coming, and can better prepare for what those things will be”. Really, it shouldn’t be. History is vastly important to any and all businesses, lifestyles, and even to the changes we are trying to make in society. Let’s draw the comparison, if we can, to the evolution of the lock. Mesopotamia, created by some genius Assyrian or Egyptian. This was probably not the original design, but it’s among the more complex versions of a lock used across the region. This was hand made, at what was likely an astronomical cost for the period, and installed as the first lock used to lock a door from the outside. It’s not the quality of the lock that progressed. The quality of the lock actually worsened. That said, let’s remember that the Greeks are known to have had what is largely recognized as the first democratic government in history. Democracy, of course, has a natural tendency to allow a body of otherwise unremarkable citizens to have recognized importance in everyday society. In other words, everyday citizens became targets for their perceived importance, and priorities changed. Not that break-ins and theft didn’t exist before the Greeks. Just that up until this point it was an expensive proposition to secure everyone. This is also known as speculation. I’m currently seeking evidence of the need for individual home security for this long ago. New York, in the late 1800’s to early 1900’s, saw a similar phenomenon that launched the alarm industry. That was due to an immense wage gap and a massive influx of new people, however, and is easily provable. Really, though, since the advent of democracy the lock industry has never looked back. 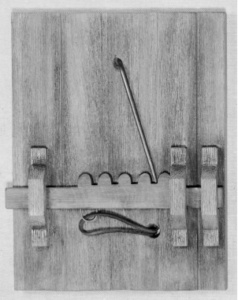 This image, not created by me, is of an example of a Roman lock. It has obvious similarities to the original locking mechanism developed in Mesopotamia. 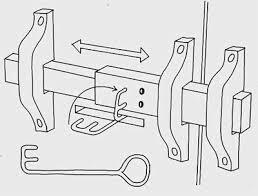 The Greek influence come from the lock being mounted on the inside of the door rather than the outside, but that is where the similarities end. 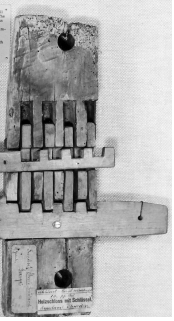 Once again, based on the different designs of this lock and the materials used to construct it I’ve come across in my research, it’s entirely likely that these were constructed as “grades”. The Ancient Romans, whose history is a roller coaster ride of political advancements stretch from their origins as a Monarchy, to a Republic, and then into Imperialism, would have found private security to be even more important than for the Greeks. Medieval times were, indeed a time of strife and political upheaval. It’s not called the dark ages for no reason. No surprise that so much time and money was spent developing new and improved lock systems, even if the end results were…varied. (There’s only so much false key holes and elaborate housings can do). And then, of course, we reach modern times. Technology advanced quickly in comparison to the past few thousand years, and yet it’s remained largely the same. Materials have changed, but the principles have not. It’s not altogether a bad thing, either. Looking at current “advancements” in security technology is more like looking at a spread sheet of different ways a lock can operate. Some of the newest stuff is substantially less secure than the older stuff… it just has the bells and whistles to sell to a rabidly competitive public. As we continue to strive to find the bells and the whistles that exist within the best secure technology to fit within your budget, we become more and more cautious to promote products we know little about. History tells us that “newest” is almost never “best”. When it happens, it’s an epic discovery. Most of the time, as demonstrated by the Ancient Greeks, it’s simply does not happen. If you have a question about a new product, or are looking into something you’re not sure of, give us a call. We’ll do our best to help, whether or not you plan on buying. I don’t unremarkably comment but I gotta tell thankyou for the post on this perfect one : D.
Hello there! I simply wish to offer you a big thumbs up for your great information you have here on this post. I will be returning to your blog for more soon. Rio0xW Very good article. I will be dealing with many of these issues as well..